The award for the winning design is $5,000, and the designer’s initials will appear on the coins. The United States Mint is looking for artists to step up to the plate to design the heads side for the 2014 National Baseball Hall of Fame Commemorative Coins. Baseball and the United States Mint—two American treasures—are teaming up to produce a new commemorative coin and make American history! The designs Americans see every day on our coins inspire, instill pride and educate. They translate our values as a Nation – and our heroes and heroines – into iconic imagery that is literally “art” in our pockets. Did you know that coin design and sculpture is referred to as Numismatic Art? Numismatics is the study and collection of coins, medals and other related objects. This history of coins dates back to ancient times. Today our coins in America are used for commerce, as an expression of artistic excellence and to honor historic moments. They link our past and future. Imagine, if you could follow in the footsteps of famed designer, Felix Schlag, from Chicago! In a 1938 competition sponsored by the United States Department of the Treasury, he submitted a design for the now famous Jefferson 5-Cent Coin. Schlag’s design continues to adorn the reverse on the nickel. Now’s your chance to make history too! The United States Mint is looking for the next great designer. Is that you? We are looking for you to help us design the obverse (heads side) of the 2014 National Baseball Hall of Fame Commemorative Coins. The National Baseball Hall of Fame Commemorative Coin Act (Public Law 112-152) calls for a three-coin program of $5 gold, $1 silver, and half-dollar clad coins, and requires a competition to select a common obverse design emblematic of the game of baseball. This is the first time the United States Mint has held a public design competition since 1992. In addition, the $5 gold coins and $1 silver coins will be the first convex/concave coins minted and issued by the United States Mint, with the reverses (tail sides) being convex to more closely resemble a baseball and the obverses concave to provide a more dramatic design. Two-dimensional designs must be monochrome, not color. Two dimensional must be approximately 8" in diameter. Three-dimensional models, if submitted, must be made using neutral plaster or a durable plastic material and should be approximately 8” in diameter. Designs must not include the name or depiction of a real player or any other person, living or not. Designs must not include depictions, names, emblems, logos, trademarks or any other intellectual property associated with any specific commercial, private, educational, civic, religious, sports, or other organizations whose membership or ownership is not universal, including any current or former baseball team, either professional or amateur. For entrants who have already submitted designs, they may revise their submissions to comply with this rule until the Competition submission period ends no later than May 11, 2013, at noon Eastern Daylight Time. Employees of the Department of the Treasury, including the United States Mint and other Treasury offices and bureaus. Contractor employees who are performing work under a contract with the Department of the Treasury, including the United States Mint and other Treasury offices and bureaus. Former contractors under the United States Mint Artistic Infusion Program. Individuals involved in the design evaluation process, including the staff of the National Baseball Hall of Fame, members of the Citizens Coinage Advisory Committee, and members and staff of the U.S. Commission of Fine Arts, are not eligible to enter the Competition. If you have any questions about the design competition, we encourage you to use the discussions tab to post them and then check back for your answer. • The Competition is limited to individuals age 14 or older who are United States citizens or permanent residents. Age is determined as of the date that the entry is submitted. Only real persons (not organizations) may enter. Each entry must be created and submitted by one person (or on behalf of only one Entrant Minor if submitted by a parent or legal guardian). • Entrants, Entrant Minors, and the parents or legal guardians who submit entries on behalf of Entrant Minors must each meet all eligibility requirements. a. Employees of the Department of the Treasury, including the United States Mint and other Treasury offices and bureaus. b. Contractor employees who are performing work under a contract with the Department of the Treasury, including the United States Mint and other Treasury offices and bureaus. c. Former contractors under the United States Mint Artistic Infusion Program. d. Individuals involved in the design evaluation process, including the staff of the National Baseball Hall of Fame, members of the Citizens Coinage Advisory Committee, and members and staff of the U.S. Commission of Fine Arts, are not eligible to enter the Competition. You must read the Official Rules before entering the design competition. • Your design must be emblematic of the game of baseball. • Your design must be approximately 8 inches in diameter. • Your design must include the following three inscriptions: “Liberty”; “In God We Trust”; and “2014”. • Because it is important that the Nation's coinage bear dignified designs of which the citizens of the United States can be proud, designs must not be frivolous or inappropriate. • Each design element must have a clear border, indicating its separation from the field or other elements around it, to allow the relief to be determined and masked off for proof finish polishing. • Designs must be coinable and appropriate for mass production. Consider that some designs that appear appropriate in a larger rendering may be too small in scale when reduced to the actual coin size. • Designs must be appropriate when reduced to actual coin sizes. For general reference, the diameter of the $5 gold coin is relatively close to the .835” diameter of a United States five-cent coin. The diameter of the $1 silver coin is 1.5 inches and the diameter of the half-dollar clad coin is the same as the 1.205-inch diameter of a Kennedy half-dollar coin. • Designs must not include the name or depiction of any real player or other real person, whether living or dead. • Designs must not include depictions, names, emblems, logos, trademarks or other intellectual property associated with any specific commercial, private, educational, civic, religious, sports, or other organizations whose membership or ownership is not universal, including any current or former baseball team, either professional or amateur. • Designs must not include any depiction of a real baseball stadium, arena, or field, either in whole or in part, whether or not currently existing or in use. • Designs must not include your name, initials, logo, artist’s mark, or other identifier anywhere in or on your design (including nonvisible portions of a three-dimensional design). The United States Mint will add the competition's winner's initials as an artist's mark to the winning design prior to minting. You must submit a black and white drawing. In must be approximately 8 inches in diameter. No color entries will be accepted. Designs may be produced using any monochromatic technique, including freehand drawing, painting, or computer-assisted design. Think of the drawing not only as a design, but also as a rendering of an actual coin (but not necessarily a photo rendering). Do not use drawing techniques that rely on dramatic effects of light and shade; instead, use line and tone to subtly indicate the sculptural qualities of the elements of your design. Line-Art entries must have a fully defined circular border. The design elements must not fade into the background. All lettering (including the required inscriptions) must be shown in either outline form (to denote a raised font) or solid black (to denote incused, or recessed, lettering). If you create a design using a digital sculpting program, you may submit your entry via up to three screen shots formatted according to the Line-Art entry criteria. Artists should use a three-dimensional shader that best reveals the relief quality of the design and focus on revealing the form rather than generating a photo-realistic rendering. Three-dimensional entries made of a durable alpha grade plaster, neutral epoxy, or other hard casting material will be accepted, if provided, and used for the final round of judging. The three-dimensional entry should be approximately 8" in diameter. Entries should be neutral white or grey color. Judging of the pre-finalist stages for three-dimensional sculpts of the Competition will be based on your entry as represented by the photographs. If you submit a three-dimensional entry and are notified that your entry has been officially selected as a finalist, you must send your actual three-dimensional entry to the United States Mint on the schedule directed by the United States Mint. You will be notified via email to do so. Remember your entry must be uploaded as an image file (e.g., GIF, JPG, PNG) up to 5MB in size. 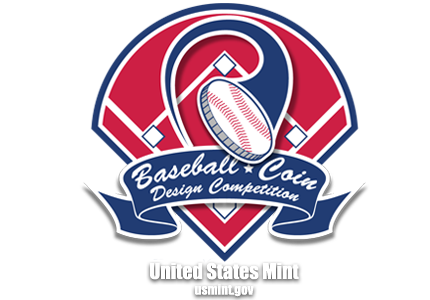 The Baseball Coin Design Competition is open from 12 noon EDT on April 11 to 12 noon EDT on May 11, 2013. All U.S. citizens and permanent residents ages 14 and older are eligible to participate. The United States Mint reserves the right to close the competition early in the event that it receives 10,000 submissions. If it appears that the number of entries will reach 10,000, we will post a notice on Challenge.gov, informing the public that the contest submission period will close early, but not less than 48 hours after the notice is posted. You must enter the design competition through Challenge.gov. Please read the Official Rules carefully to determine eligibility and to understand the rights transfer agreement before entering the competition. 1. Please register with Challenge.gov. You will need to do this before entering the competition. Go to the Challenge.gov homepage and click on sign up and participate. Once you complete this process you will receive a confirmation from Challenge.gov. 3. You will then begin the process of filling out the submission form for the batterup challenge. 4. Upload an image file of your design. Please read the Official Rules carefully to ensure that your submission meets all of the mandatory requirements. Please note that you will be asked to upload your design information twice. The second prompt will be for the for File upload section (PDF, ZIP, Word Doc). This is also the section where those who choose to create a 3 D Sculpture can submit photographs of the sculpture. 5. In the description summary area provide a brief statement describing your design and how it relates to the game of baseball. Please be sensitive that the rules have strict guidelines about what is appropriate and what is not. Please feel free to email baseballcompetition.usmint.treas.gov with any questions that you may have regarding the submission process. Remember, your design can be saved and edited before it is officially submitted. • Your submission must be your own original artwork. • Two-dimensional designs must be monochrome, not color, and approximately 8" in diameter. Three-dimensional models, if submitting, must be made using neutral plaster or a durable plastic material and should be approximately 8” in diameter. • Designs must not include the name or depiction of a real player or any other person, living or dead. • Designs must not include depictions, names, emblems, logos, trademarks or any other indications associated with any specific commercial, private, educational, civic, religious, sports, or other organizations whose membership or ownership is not universal, including any current or former baseball team, either professional or amateur. • Designs must not include any depiction of a real baseball stadium, field, arena, either in whole or in part, whether or not currently existing or in use. • Read the Official Rules carefully to ensure that your submission meets all the required criteria. • Check your email on and around May 31 to see if your design is a semifinalist. You will be contacted if your design is selected as a semifinalist and you will be asked to submit a signed Rights Transfer Agreement (and Parent /Legal Guardian Consent Form, if applicable). Baseball Hall of Fame members will evaluate the semifinalists for how the designs represent the spirit of baseball.